If you have anything more than a passing interest in technology (and let’s face it, you probably have if you’re reading this! ), then you’ve probably caught wind of the recent addition to Samsung’s family of TVs in form of their exciting 8K range. Now, before you go tearing your hair out over your recent 4K television purchase, it’s probably best that we explain a little bit about why these TVs have been made – and why it doesn’t spell the end for 4K TV just yet. 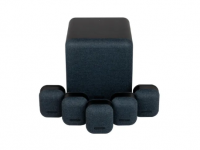 There’s absolutely no doubt that the average living room television is getting larger with each purchase. The advent of 4K TV, movie streaming and gaming has seen us all jump up a screen size or two (or four! ), and the level of detail that we’re now getting is unlike anything that has gone before. Even a basic, entry-level LED TV is likely 4K, and 55”+ screens are getting cheaper all the time – meaning more and more of us have got them. 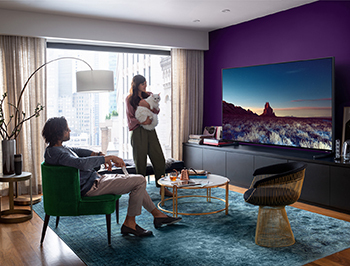 If you really want to go for the big screen effect, though, that 4K resolution could almost start to feel a little bit stretched – and this is precisely where Samsung’s 8K QLED range come into play. These screens are available in sizes starting from 65” and currently take in a 75” and 85” model! Once we’re playing with screens of this size, having an increased resolution is certainly very handy, if not crucial. 8K has twice the horizontal resolution as 4K (which is where the name derives from). This, combined with the fact it also has twice the vertical resolution, means it has 4 times the sharpness of a 4K TV. Whilst there is currently very little 8K content around, the main draw with these premium sets is their ability to ‘upscale’ any incoming 4K image (or lower), and dramatically increase the perceived level of detail across the 33 MILLION pixels that make up the display. 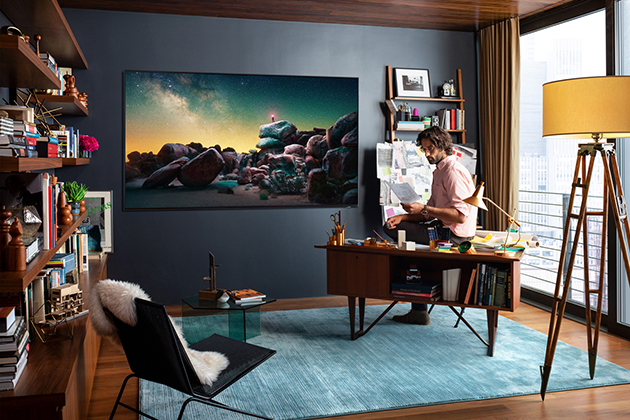 Samsung have used their own, unique QLED TV panels when designing the 8K screens too, meaning that they offer staggering levels of brightness in comparison to a normal LED TV – and most importantly, against a projector, which is the more likely competitor in this massive size bracket. In practice, this upscaling of 4K images, coupled with the vibrant and realistic colours and brightness of the QLED are truly staggering. At a recent launch show that we attended, it was clear this extra increase in resolution was absolutely something to shout about. All of the hallmarks of the smaller QLED range are here too, with the stunning design cues that Samsung have long been known for, and the excellent range of Smart features that are expected from any Samsung set. The in-built AI capabilities also make this one of the, ahem, smartest TV’s on the market, helping to make navigation and content selection a breeze. And if you’re worried at all about having such a big TV leaving a big, blank space on your wall when it’s off, then you’ll be delighted to hear that Samsung have included their superb ‘Ambient’ mode for these 8K QLED’s, allowing the TV to seamlessly blend into the background of your room by matching the pattern or colour of the wall it is displayed on. They’ve thought of everything! 8K QLED TVs are now available to demo in selected Richer Sounds stores. 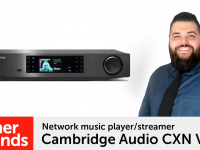 So why not call or pop in to your local Richer Sounds store today, and speak to one of our experts about how 8K can take your viewing experience to a whole new level? Could you tell where I can view an 8k 75” Samsung TV. 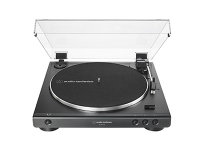 It sounds amazing and am little annoyed as I purchased a new OLED Tv earlier this year. My fault not yours. 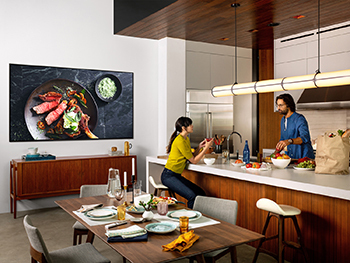 Samsung 8K QLED TVs are available to view at several of our locations around the country. If call 0333 900 0093, our Telesales department will be able to assist you further.